Brunobaby done tagged me, and now I’m it. I didn’t even know I was in the game! But I’m a good sport, so I’ll play along and, nouvelle vague-style, submit to the interview. 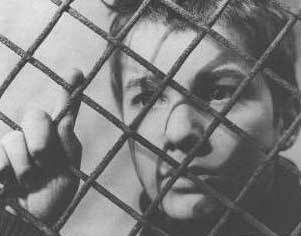 Please picture me as a 14-year old Antoine Doinel as I respond. 1) Name a book that you want to share so much that you keep giving away copies. I usually don’t give away books on purpose, but it, ahem, happens sometimes. Instead, I’ll link to something nice on Project Gutenberg. Something sweet that matches my current mood. How about this? 2) Name a piece of music that changed the way you listen to music. Schoenberg’s Three Piano Pieces, op. 11. I remember listening to these pieces over and over and then finally, a switch flipped and I heard them differently. Something changed in the way I was perceiving the music, opening the door to what would become my work for the next 10 years. 3) Name a film you can watch again and again without fatigue. 4) Name a performer for whom you suspend all disbelief. In the age of freedom fries, willing suspension of disbelief is pretty much a pre-requisite for getting up in the morning. If enough people don’t stop believing pretty soon (on a geological scale) and start thinking, we’ll be history. 5) Name a work of art you’d like to live with. The beautiful Mark Wiener painting we recently acquired that now hangs over our bed. Apart from that, there are any number of Rothkos, de Koonings, Klees, and heck, pretty much anything from the rose and blue periods that would do nicely. 6) Name a work of fiction which has penetrated your real life. Sorry, I don’t like the patriarchal tone of this question. 7) Name a punchline that always makes you laugh. Hey, thanks for picking up the tag! “Notes From Underground” was loaned to me by a co-worker at a word processing job back in the ’80s. He said it described the way we always complained about the job, meanwhile having no intention of leaving it. >>6) Name a work of fiction which has penetrated your real life. >Sorry, I don’t like the patriarchal tone of this question. LOL! Okay, name a work of fiction that has yonically enveloped your real life. You might like Sokurov’s film on Rostropovich and Vishnevskaya, “Elegy of Life,” which I saw Saturday. Made in two parts (for TV it seems), some parts are too long and too similar. But like all Sokurov films, it gains something by its dwelling. It’s their golden anniversary. Locations are their richly appointed apartments, rehearsals at the Musikverein for Rostropovich’s last premiere concert, coaching sessions at Vishnevskaya’s opera centre. As always, Sokurov is meditating (on the “old Europe” of great musicians, great halls, great audiences — possibly great residences, marriages — wondering what the future will be). His apparent reverence for rich surroundings soon has you reaching for your Bakunin, but I’m not sure that isn’t simply the nature of his subject. And it means he captures it well. If you haven’t been to the Musikverein, you get a masterful taste of it here. There are lovely shots of Ozawa rehearsing, of the truly beautiful and characteristic faces of people attending, of the 80-year-old Rostropovich kicking up his heels at his wedding celebration. Tedium in Sokurov is the duration of his gaze on a sameness; but here the mine of contrast he is working is the personalities of the couple (in the context of a celebration of the strength of their union). Rostropovich is good-humoured and relaxed and easy-going; Vishnevskaya is drama and passion and reason and sorrow; both are very Russian; it’s a study in something that works. And thanks to Sokurov’s film-maker’s eye, a highlight is a wonderful glimpse of Vishnevskaya in a film version of “Katerina Izmailova,” where all the groundwork he has laid regarding her nature is captured in an intense, passionate murder-drowning sequence. A wonderful thing is that the Canadian Opera Company is now playing Lady Macbeth of Mtsensk (so I now know what that Izmailova clip was about). For me, this fell the day before Lee Breuer’s Mabou Mines Dollhouse. Lady Macbeth, Dollhouse, Imamura all mix and switch tones at the drop of a hat — not always successfully. (The Shostakovich is particularly hard to get a handle on.) But seeing them all at once, with the chance to think about this, is a wonderfully rich, ricocheting experience.